Gone are the days when you could have walked into a charming old empty building in Prenzlauer Berg, decided you liked it, and walked out a resident. Gone are the days when you could have rented a huge apartment in Friedrichshain for a pittance. Gone are the days… well actually, enough of that. You’re not here then. You’re here now. But be warned: people who live in Berlin do love to hark back to the good ol’ (cheaper) days. Everything about Berlin has changed and developed since the city’s reunification in 1990, and housing and how much it costs is a part of that process. Finding somewhere to live is undoubtedly one of the most important, and at times tricky, parts of moving to Berlin. As with so much of life in Germany, there is a lot of paperwork to get through. And of course (not lamenting, just mentioning) the demand for accommodation is increasing continuously as more and more people realise that Berlin is a pretty amazing place to live. In 2015 alone, over 182,000 people moved to the city and that was three whole years ago. That being said, while home-hunting might be a slightly higher hurdle than it was before, you have the advantage of having this guide to help you. We’ll fill you in on everything you need to maximise opportunity and minimise stress in what can often be a rather competitive race. We’ve said it before and will undoubtedly say it again: preparation is the key to success here. Knowing what you’re looking for and what to expect will definitely set you off along the right road so BE PREPARED (not in the maniacal way Scar sings it before orchestrating Mufasa’s death; imagine a much more jovial and encouraging tone.)! There will be a lot to look at during your search so a good way to narrow that down a little is to write yourself a list of needs and/or wants for your desired accommodation. Do you want your own place or to share with flatmates? Will you need to be on good public transport routes? How big do you need your flat to be (think in square metres)? There are lots of details about the place itself that don’t have to be set in stone but sitting down and thinking about the things that matter to you is a great way to start your search. First things first, it’s good to know what kind of place is available to you. As everyone knows, there are different strokes for different folks, and while finances can play a big role in the place you eventually move in to, other factors such as social life, administrative paperwork, and convenience play into it too. So, what options are there for you? If a flat to call your own is your dream, then you really need to be prepared. Germany has one of the lowest rates of home-ownership in the world, meaning the majority of its inhabitants are renters. The rental market, therefore, is heavily regulated and largely in favour of the tenant. ‘Rent caps and tight restrictions on landlords? It sounds like a dreamland!’ we hear you cry. Yes. Well, kind of. Those strict rules mean that it is difficult for landlords to evict tenants. Again, great! Again, sort of. What all that basically means is that landlords are generally extremely keen to ensure that they have reliable tenants and so can be very particular when it comes to applications. Surprise! That means more paperwork, but we’ll get to that shortly. Be aware that most flats are rented unfurnished, even down to the kitchen units, which means after paying the deposit and rent you will have the additional cost of filling your new home with places to sit and sleep and put things. WG is a term you will see a lot. It is the abbreviation for Wohngemeinschaft which is the German term for a flat share. WGs are often the best bet for new arrivals to Berlin. Maybe you don’t have the money to get a place of your own, maybe you do but you don’t have all the necessary paperwork, or maybe you just want to meet new people; this is the answer. Generally, you have your own room and share common spaces. Remember that flatmates can really affect life in the flat so choose wisely. These types of accommodation can be a great place for newbies to the city to stay at first, although they can be a little more expensive. Whether it’s for a week, a month, or a year, having somewhere that is already fully kitted out gives you the time and space to thoroughly look into and find the place you’ll be long-term, without having to worry about buying furniture or setting up your own utility contracts straight away. They can alleviate any feelings of panic and take the rush out of the process. They also, more often than not, do not require the paperwork that you would need in order to get your own lease, therefore can be a great way to break the nonsensical circle of needing an address to open a bank account and a bank account to get a SCHUFA record (more information to follow). There are two different ways to look for temporary and/or furnished accommodation. The first is a sublet, called Untermiete or Zwischenmiete in German. Zwischenmiete literally means ‘between rent’ and the idea is that you rent someone’s flat in the ‘in between’, while they are away on holiday, for example. These are legal so long as they are with the landlord’s consent and are not for profit. The second way is through a number of agencies that provide fully-furnished, sometimes even serviced, apartments. They normally incorporate their fee into the rent and therefore can be more expensive than usual. Immobilienscout24; Immowelt; Immonet; Wohnung-jetzt: some of the biggest sites used by property agencies and landlords, for entire apartments with your own rental contract. eBay Kleinanzeigen: a classifieds site with all sorts of listings. WG-gesucht: despite its title, the listings are not just for WGs. There are rooms and entire apartments, short- and longer term. WG-suche; Easywg; Wohngemeinschaft: a few more WG search sites. Facebook: believe it or not, there are a wealth of groups on Facebook offering rooms in WGs, short-term sublets, and even entire flats. City-wohnen; White Apartments; Wunderflats; Crocodilian; Nestpick: some agencies offering furnished apartments for an additional fee. Now you have a loose idea of what sort of apartment you’d like, without a doubt the next biggest question is: where? The district in which you choose to live is such an important topic that it warrants its own post, containing a summary of each neighbourhood in Berlin. Naturally, prices vary greatly depending on which area of the city you’re looking at. 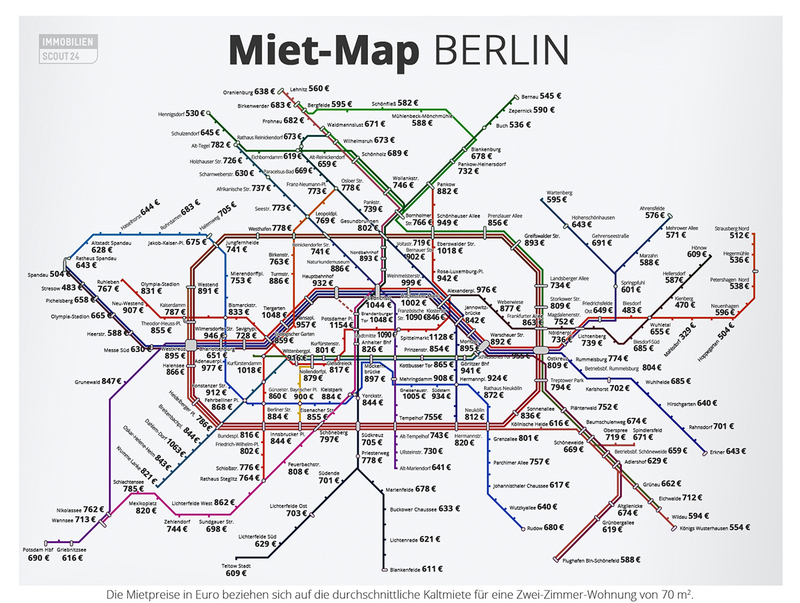 The map below shows the average price for a 30 year old, 70m², two-room apartment in different areas of the city based on the public transport map. With this interactive map you can search by budget, area or size of flat and the data is much more recent. Once you get into the process of looking at apartment listings you’ll start to be able to gauge better for yourself what seems to be reasonable or at least average for area/size etc. An important thing to know about rent prices is that in Germany they are labelled Kaltmiete or Warmmiete. Literally translated, Kaltmiete means ‘cold rent’ and is the base price of rent alone without any additional costs. Warmmiete is ‘warm rent’ and means base rent plus Nebenkosten, which are things to do with building maintenance, and sometimes heat. Beware – just because it says warm doesn’t mean heating is included; check the details in your contract to be sure what is covered and what is not. As mentioned before, landlords want to make sure that whoever they rent their apartments to can pay the rent, and comfortably, so be aware that it’s not an uncommon condition for your income to be around three times the rent amount. Even having a large amount of savings might not cut it, they want to know that you have a regular and stable income that won’t just run out one day. On that note it’s also good to keep in mind that the deposit, or Kaution, for an apartment can be anywhere from one month’s rent to a full three times that. As discussed previously, there are accommodation options available to you that will not require this paperwork, but if you are looking to get your name on your own rental contract then this is what you will need to have ready to go along with your application. If you’re looking in hugely popular areas like Kreuzberg or Prenzlauer Berg be aware that it isn’t unusual for people to bring all this to a viewing in case they like the apartment and want to get their application in immediately; just something to consider. Personalausweis (Passport) – a photocopy of your passport. SCHUFA Auskunft (credit record) – it may seem strange but SCHUFA is private a company that holds the credit records of every German resident. Every single bill you have to pay is taken into consideration for your rating, and that rating will affect your ability to apply for nearly anything that you have to pay for. Basically it rates your financial reliability and IT IS VERY IMPORTANT so pay your bills and keep your rating high. A record is created for you automatically when you complete your Anmeldung. However, you’ll need to apply to SCHUFA directly in order to have proof of your credit rating for landlords. Einkommensnachweis (proof of income) – you will need payslips or some form of proof of income for at least the previous three months. If you have just landed in the city and already have a job lined up then a signed employment contract can also be used here. Mietschuldenfreiheitsbescheinigung (free from rent-related debt certificate) – Yes, Germans love long confusing words at times but this one is important. It is a signed document from your previous landlord stating that you are free from all debts related to that rental and that you paid on time and in full during the duration of your tenancy. Bank statements – while not always necessary, it can sometimes be required to show these too, just as another confirmation of financial reliability. No doubt you’ve established by now that the mother tongue of the country you’ve decided to move to can be somewhat tricky at times, and unfortunately the terminology used in apartment listings is no different. Here follows a list of words you should know to look out for during the house hunt. Good luck!